This is my family favorite meal, I could bake every week. Final fermentation: 45 – 60 min. at 75°F. Baking: 450°F in convection oven for 30-35 min. 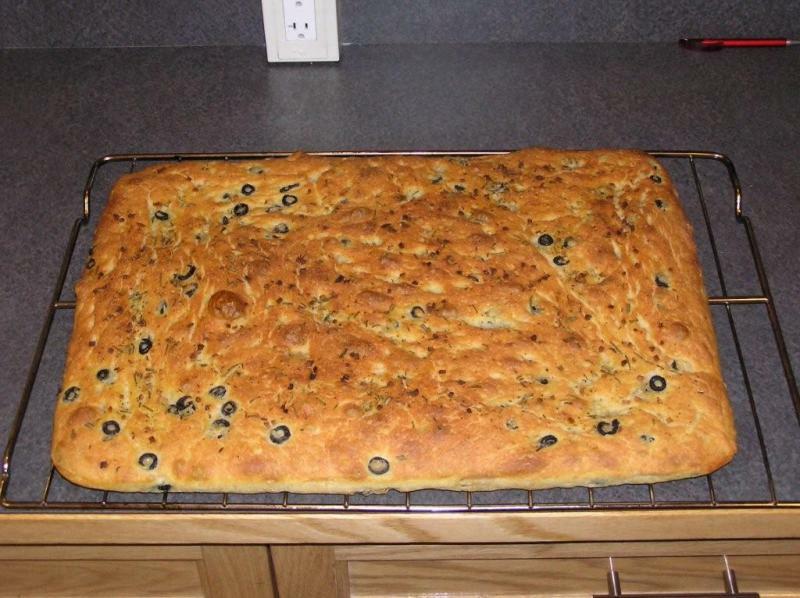 Nice looking focaccia Mirko. In fact, I like the looks of yours much more than the one in the video. You mentioned "Sprinkle some fresh garlic, rosmary, onion, olives or even what you like" but yours looks like you did more than "sprinkle" those olives. Do you fold those in or are they pressed that far into the dough? 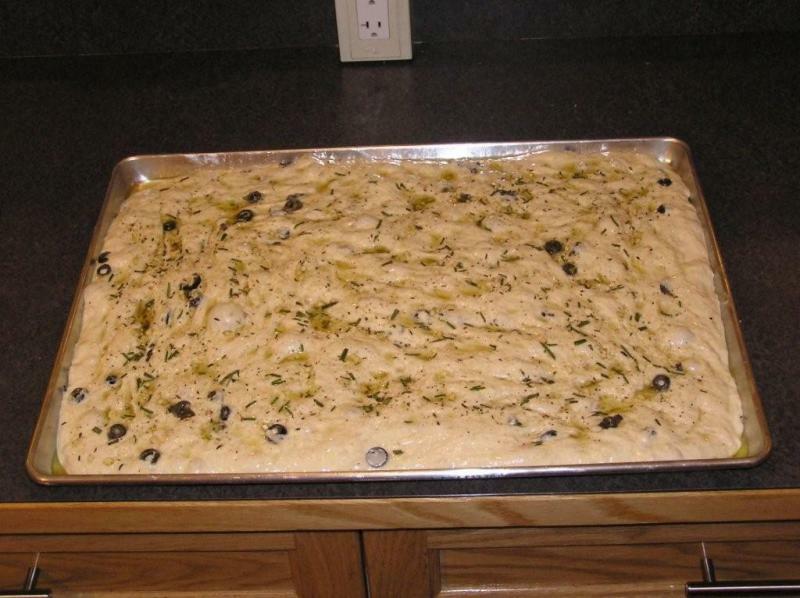 olives get dry, this time worked into dough. If you will use salted olives first rince dem out, additional salt will slow down the fermentation. Mirko..this is a wowee...I would love to try it but hope you could indulge me with the equivalent measurements that are non-metric (US measures). In addition, I have a question about the poolish..do you make it and let it sit for a while before you add it to the recipe? Thanks so much for sharing this with us..
that this would also make a fine pizza dough too! Very nice baking! I've never had any problem with salty olives slowing down Italian flat breads, even if many were used. That crumb of yours is just fantastic. It has to be delicious. Put some Mojo de Ajo on it with some sun dried tomatoes inside ...... I've got to give it a try with yours looking so great! Thanks for posting your recipe too. Thank you for comments guys! for proper fermentation. So I just trying to be carefull. Mirko..I appreciate the link to the metrics converter...I will put it to good use.. 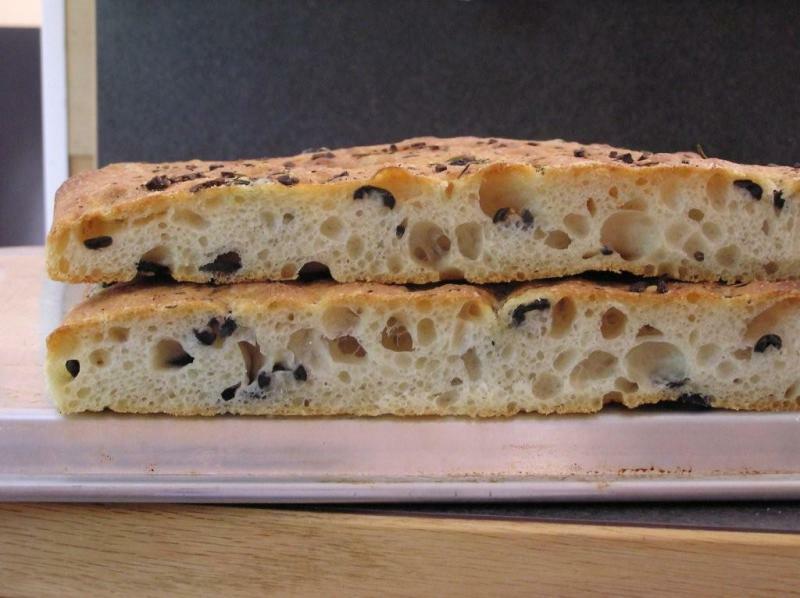 I hope I can get the height and holes in the dough that you were able to achieve with your focaccia.. I think you will definitely get some nice holes because there is poolish and 78% hydration dough. The dough is verry wet and sticky so wet your hands (or use some oil) when doing strech and folds. Ok I made this recipe and it came out ok. I think my measurnig of the yeast might have been the problem. What type of scale is everyone using that can get down to the tenth of a gram???????????????? I can't see to find any that go less than 1g. Scales : I've been using a mini scale like these for measuring small amount of ingredients, like dried yeast and salt. (Mine is Tanita KP-103 on the top) If you search on internet under 'digital scale 0.1g increments), I'm sure you'll find a lot of them. There wasn't much choice when I bought mine several years ago, but these days there're normal-sized scales wtih 0.1g incremetns and a (relatively) new type of scale/spoon like, like this, too. But if you don't want to spend money on another scale, a scant 1/4 tsp is roughly 0.8 - 1 g dried yeast. Great looking focaccia, Mirko, btw. Thank you for sharing. :) I also make 50% poolish focaccia often, but with a little lower hydration (about 75 %) plus addition of some olive oil. Must try your (or Hitz's) recipe soon..... though I have to hand-mix the dough as I don't have a machine...:p Have you tried retarding this for a long time, like overnight/16+ hrs? You don't a scale go lower than a gram. The weight of less than 1 gram is so small it won't matter. I agree Ian. Whenever I have a recipe that calls for, let's say 12.5 g of salt, I just add till scale tips to 12 g, then I just add small pinches well before it tips to 13 g. That will be close enough. I used to be worried about this, but no longer. Mirko. I have only baked focaccia twice last summer but you have reminded me how much I would love to have this bread around the house again. Thanks and great bake! I am a fan of brushing the tops with olive oil then sprinkling with coarse salt after the bake.